La richesse du son analogique du magnétophone multipiste à bande le plus populaire au monde. Depuis plus de 30 ans, les artistes comme les ingénieurs sont attirés par la chaleur du son analogique, les graves solides et la présence globale du magnétophone multipiste à bande Studer® A800. Le nombre d'albums enregistrés sur ce magnétophone à bande 2" de légende – dont certains devenus des classiques de Metallica, Stevie Wonder, Tom Petty, A Tribe Called Quest et Jeff Buckley – suffit à illustrer brillamment la musicalité de la bande analogique. Dûment authentifié par Studer et modélisé durant 12 mois par l'équipe d'ingénieurs - de renommée mondiale - d’UA, et Jay McKnight, expert AES de l'enregistrement magnétique, le plug-in Studer A800 Multichannel Tape Recorder pour systèmes UAD-2 et interfaces Apollo est le premier produit du genre. Grâce à une modélisation fidèle de l'ensemble du trajet du circuit du célèbre A800 de la collection d'Allen Sides aux Ocean Way Studios, le plug-in Studer A800 est la représentation la plus exacte qui soit de l'enregistrement analogique professionnel multipiste sur bande. Sorti en 1978, le Studer A800 a été le premier magnétophone à bande contrôlé par microprocesseur. En avance sur son temps de plusieurs années, l'A800 reste depuis une référence en matière de son que l’on trouve encore aujourd’hui dans des studios du monde entier. Cependant, avec un châssis en acier massif et un bandeau de VU-mètres, deux moteurs d'un demi CV et des platines en alliage moulé, l’A800 d'origine et ses 400 kgs bien tassés faisaient grincer les vertèbres et la balance. Le plug-in Studer A800 Multichannel Tape Recorder n’a aucun des inconvénients du hardware, mais conserve toutes les superbes caractéristiques sonores qui font de la bande un support d'enregistrement tant convoité. Tout comme avec la bande magnétique, vous pouvez obtenir un son propre, ou juste ce qu'il faut de saturation harmonique au moyen des commandes Input et Output du plug-in Studer A800. La commande IPS de la platine à bobines donne le choix entre trois vitesses de bande (7,5, 15 ou 30 pouces/s), chacune ayant ses propres caractéristiques de décalage et de bosse de fréquences, ainsi que de distorsion. La commande de type de bande permet aux utilisateurs de choisir entre quatre des formules de bande magnétique les plus populaires – chacune avec ses propres variations subtiles de la sonorité. La commande Cal donne le choix du niveau d'étalonnage entre +3 dB, +6 dB, +7,5 dB et +9 dB. Les commandes secondaires sont cachées derrière la platine des bobines, et peuvent être dévoilées en cliquant sur la plaque Studer ou sur l'indication Open. Ces commandes comprennent une fonction Auto Cal, plus des réglages Hiss et Hum pour le chuintement et le ronflement de la bande, avec un bypass global du bruit. Enfin, une fonction Gang Ctrls vous permet de coupler les réglages de toutes les instances de plug-in Studer A800 de votre session afin de les modifier simultanément et identiquement. Le principal usage recommandé du plug-in Studer A800, c'est comme premier insert sur chaque piste où vous souhaitez un son de bande. De cette façon, vous pouvez entendre l'effet cumulatif de « cohésion » de l'enregistrement sur bande magnétique lorsque vous composez votre mixage (bien sûr, il peut aussi sonner de manière incroyable sur les bus de mixage). Veillez bien à d'abord éliminer tous les autres plug-ins – vous pourriez bien finir par utiliser moins de compression et de correction fréquentielles, constatant ainsi que vos mixages « se lient » plus facilement. Le meilleur du son analogique à bande sans les problèmes de calibrage, entretien, usure des bandes, etc. I've owned this for a while, and I'm finally comfortable enough to write a review on it. Subtlety seems to be the key word with this thing. I don't like what it does to the low end, but find it can really warm up mids and smooths things up when pushed just a bit. I don't like kick feeding into it so I keep off of the master bus (or have kick by pass it); and same deal with drums bus. Saturating it a bit on vocals can be nice, but again subtly. This thing is a DSP hog, but I do love it for premasters. As a DUO owner, I tend to reach for other tape emulators first (e.g., J37) before using this for that reason. This badboy here is amazing, I usually put it on my kick drum and snare and my god is just tape music to my ears I can describe it is just big body and meaty definitely go to on all my ongoing projects. But to be honest I mainly used this bad boy on vocals. I mainly do Hip Hop Pop and R&B! My vocal chain is U87 70's ver. - Through the UAD neve 1073 - Studer A800 - Pultec -La2a silver and my God Vocals never sounded better, it's the Million dollar studio vocal quality everybody's been searching for. Thanks UA i'm your customer for life! I recommend the studer to everybody! Not to violate any confidentiality agreement between me and Apple corp, I believe my audio drop out problem (re: my last post) is finally solved so.....I will give this plug a hearty 5 stars! 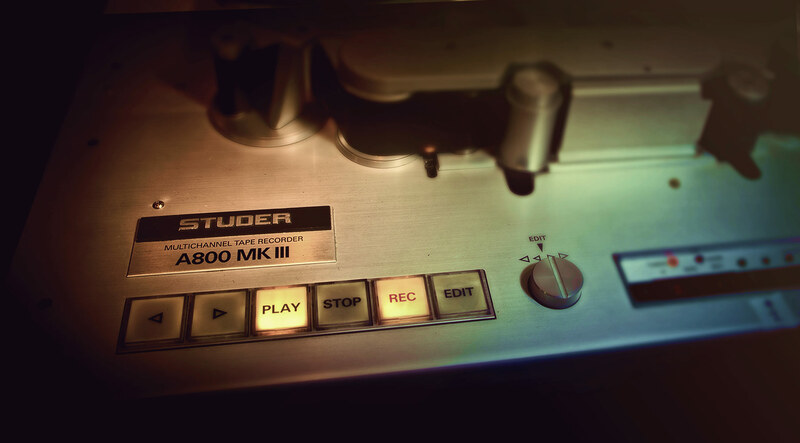 The Studer A800 is the first plugin I place across my mixes. This helps me get a good sound right off the bat. Once I dial it in, I proceed by placing the SSL G Buss Compressor on the Master Bus and start mixing from there. Do this and not only will you end up using less EQ and Compression, but your mixes will sound better because of it. Don't forget to play around with the Bias and HF filter. That's where the magic is at! Playing a mix through Studer (and Ampex) creates the same improvement one might find between icemilk and icecream! Not sure if any of you guys were ever poor enough that your parents bought you icemilk but believe me... Its night and day!!! I purchased this plugin when it came out over a year ago. Right after I purchased it they came out with the Ampex plugin. That was the one I really wanted to run on the 2 track bus. After using this plugin (Studer 800) on the 2 track bus and also after I started the Ampeq 14 day demo I was a little bummed out I did not purchase the Ampeq. A few weeks later I stuck the Studer on every channel of my mix (only the drums & bass tracks) and I was amazed at what it did. About 7 years ago I sold my Otari MTR-90 so I am very familiar with tape machines and how they sound. If you run this plugin on your drum & bass tracks it just glues them together. There is no need to spend thousands of dollars up keeping your 2" anymore with this plugin. A little effort and you're in analog heaven! While at a session in L.A. last week, the band and I over the songs a few times as the engineer was getting tones and recording them to Pro Tools (sounded fine). Then we tracked the keepers onto a 2" Studer machine. I couldn't stop grinning after hearing my kit played back through that deck (it's been so long, I'd forgotten what tape does for drums). When I got home I started the A800 demo, tracked some drums and right there in front of me was that sound. Subtle on the overheads (like they were EQ'd - with really awesome EQ), more pronounced on kick & snare (the body of the drums were pulled forward, whereas it was mostly attack before). The price kept me from trying this out before. Don't be stupid like me, buy this. I finally did. I am now beginning to feel the way i used to about making music thanks to Universal Audio. Since my recent buy of Studer A800, plus a strategic change in my way of mixing. As you can listen from my artist page (www.indabamusic.com/people/Mimidhof). My two latest Remix Submission were done using Studer A800 on every track. I'm owner of a simple DSP Duo core.. so I hesitate because of the price of the plugin and also because of using it in every track would fast let me without any DSP resource. But I'm very glad of the result over all on the Drum track and the bass sound they are easyer to fit in my mixes. And I just begin to use it. For my setup with little DSP ressources, for this plugin I took the decision to use it as an offline process, when I begin a new mix I process all my track with Studer A800. To my mind, there are two things that resolve the 'in the box / outside of the box' argument. The first one is production and mixing experience i.e. really knowing and understanding what you are doing, and the second is getting the Studer on every first insert (or every first insert of your most prominent elements if you are having to budget your DSP accordingly). When the Studer's start working their magic, your mixes will have so much more sonic appeal, that you will soon put in the hours required to gain the experience, so it's the best starting point you'll ever define. I have been recording on a 1" 16 track tape machine for years. I never really wanted to go digital, but once I saw THIS plug-in I knew it was time to make the jump. Being a total tape snob I really have to say that UA really blew my mind with the Studer plug-in. I can even make my track sound like a blown out, old hissy reel. I can't wait to get the Ampex next. There are hidden wonderments built into this plug in that I can't imagine. It has kept people who have even BIGGER EARS than I do so satisfied that I wanted to write to tell the folks here about it. More later but YOU GUYS ARE INCREDIBLE. I'm impressed and I'll be hunting more tasty gadgetry from you before the new year is rolled in. An amazing plugin / "Set it and forget it!" I love this plugin. I use it on individual tracks and on the whole mix. I'm sure, that with enough hours and hours of work you could re-create what it does with a bunch of really precise EQ plugs but it's just astounding how easy it is to slap this plug on and get warmth and 'fatness'. It's my new favorite. I know that I will never be able to afford or operate properly a physical version of this machine. I love the ability to just have it right there, a mouse click away and in multiple instances of this great tool. Throw it on your track and swim through the many great presets, read the manual, and I guarantee you will be able to find that analog sweetness you desire. I've tried many tape simulators since I bought my first Pro Tools in 1996. Working with the DAW in the early years, I sadly missed the A-800 and the Ampex MM1100/1200 that were instrumental in making that rock'n'roll sound after which many generations of music makers have modeled their preferences. But when I insert the UAD A-800 plug-in on the live drums, it's like taking a ride in a Time Machine - right back to mid-80's when the analog machines were at their peak! I insert on the overhead mikes and it produces the crushing that squeezes the kit together tightly. Now I'll be waiting for you guys to work on the AMPEX 8-track. Why not go over to Les Paul's and measure his machine? Less "tapey" than the Ampex, but given tone shaping uniqueness and low DSP draw, perhaps more useful. If you work hard to track good, clear sounds, but need a little bite taken off individual tracks during mixing, this is your ticket. Awesome. This is a really good simulation of Studer A800. It's always so hard to repeat an analogue existence in digital world but I think UAD did it. It's saturation is very realistic and so easy to understand how to use. By the way, ''ganging'' feature is genius to emulate 24 channel input on the same deck. Thanks for all UAD team, from customer support to engineers! This is a reason to buy UA products by itself. Its usefulness cannot be overstated. On every channel of every mix, Period! Unbelievable - I love it!! Wow, i must say this plugin is worth twice its price. It has done wonders for my mixes, tight bottom end and smooth highs. I now spend less time tweaking the EQ's on my tracks. Digital process has come a long way. Well done UA keep up the good work.